Vismach is a set of Python functions that can be used to create and animate models of machines. 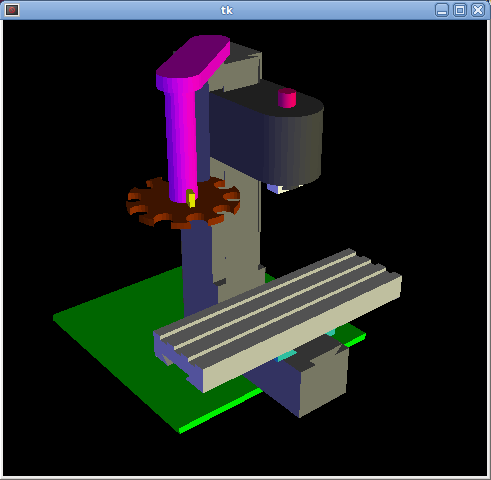 Vismach displays the model in a 3D viewport and the model parts are animated as the values of associated HAL pins change. rotate by middle-button drag or shift-drag. A Vismach model takes the form of a Python script and can use standard Python syntax. This means that there is more than one way to lay out the script, but in the examples given in this document I will use the simplest and most basic of them. It is useful for testing to include the #!/usr/bin/python to allow the file to be run as a script. The first thing to do is to import the required libraries. 2. Create the HAL pins. Hal pins are created with the normal Python "hal" library, and are not specific to Vismach. Further details can be found in the Creating Userpace Components in Python section. A component should be created with a name that matches the script file name and then the HAL pins are added to that component. They will be referenced by their component handle and short name when used to animate the Vismach model. Will create HAL pins samplegui.joint0 and samplegui.joint1. When loading the Vismach model with loadusr -W samplegui the c.ready() function tells loadusr it’s ready. The parts will be created in the Vismach space in the same locations as they occupy in the STL or OBJ space. This means that it may be possible to assemble the model in the CAD package. Alternatively parts can be created inside the model script from a range of shape primitives. Many shapes are created at the origin and need to be moved to the required location after creation. Creates a (optionally tapered) cylinder on the given axis with the given radii at the given points on the axis. Creates a triangular plate between planes defined by the last two values parallel to the specified plane, with vertices given by the three coordinate pairs. Creates a rectangular prism with opposite corners at the specified positions and edges parallel to the XYZ axes. Creates an xw by yw by zw box centred on the origin. Creates a box of width xw / yw and height z. Parts may need to be moved in the Vismach space to assemble the model. They may also need to be moved to create the animation as the animation rotation axis is created at the origin (but moves with the Part). Move part1 the specified distances in x, y and z.
Rotate the part by angle theta about an axis between the origin and x, y, z. To animate the model (controlled by the values of HAL pins) there are two functions HalTranslate and HalRotate. For parts to move inside an assembly they need to have their HAL motions defined before being assembled with the "Collection" command. The rotation axis and and translation vector move with the part as it is moved by the vismach script during model assembly, or as it moves in response to the HAL pins as the model is animated. The function arguments are first a collection/part which can be pre-created earlier in the script, or could be created at this point if preferred eg part1 = HalTranslate([Box(…. )], …). The the HAL component is the next argument, ie the object returned by the comp = hal.component(…) command. After that is the name of the HAL in that will animate the motion, this needs to match an existing HAL pin that is part of the HAL component created earlier in the script. Then follow the X, Y, Z scales. For a Cartesian machine created at 1:1 scale this would typically be 1,0,0 for a motion in the positive X direction. However if the STL file happened to be in cm and the machine was in inches, this could be fixed at this point by using 0.3937 (1cm /2.54in) as the scale. This command is similar in its operation to HalTranslate except that it is typically necessary to move the part to the origin first to define the axis. The axis of rotation is from the origin point to the point defined by (x,y,z). Rotation angles are in degrees, so for a rotary joint with a 0-1 scaling you would need to use an angle scale of 360. When the part is moved back away from the origin to its correct location the axis of rotation can be considered to remain "embedded" in the part. Create the head main body. Create the spindle at the origin. Move the head to the spindle or spindle to the head. Define the motion of the head assembly. Sets the display color of the part. Note that unlike the other functions the part definition comes second in this case. The colorspec consists of the three RGB values and an opacity. For example [1,0,0,0.5] for a 50% opacity red. Creates a heads-up display in the Vismach GUI to display such items as axis positions. I have no idea what this does, but it seems to be important for tool tip visualization. This is the command that makes it all happen, creates the display etc. "model" should be a collection that contains all the machine parts. "tooltip" and "work" need to be created by Capture() to visualize their motion in the back plot. See scaragui.py for an example of how to connect the tool tip to a tool and the tool to the model. Either rotation_vectors or latitude / longitude can be used to set the original viewpoint and it is advisable to do as the default initial viewpoint is rather unhelpfully from immediately overhead. size sets the extent of the volume visualized in the initial view. hud refers to a head-up display of axis positions. 8. Basic structure of a Vismach script.